This is a beautiful 1942 or Showa 17 World War II era Japanese map of Australia and New Guinea issued by the Economy Research Bureau of Manchuria Railway Corporation. 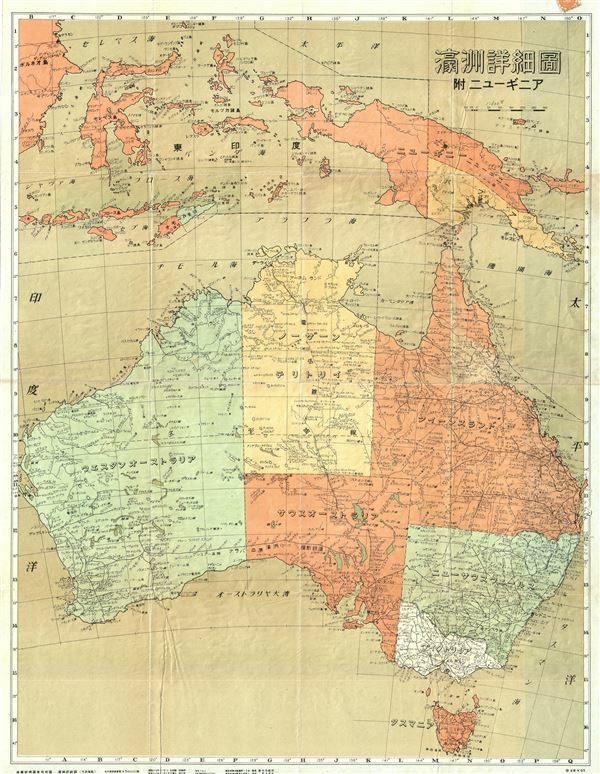 It covers Australia in its entirety, including Tasmania, as well as the islands of New Guinea, the Maluku Islands and Sulawesi Island, Indonesia. The map is highly detailed and notes rivers, lakes, roads, railways, islands, shipping lines and other topographical features. Issued by the Economy Research Bureau of Manchuria Railway Corporation in 1942. All text is in Japanese.